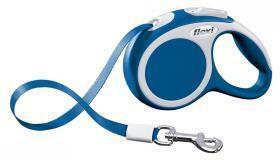 Flexi Vario retractable lead size extra small, tape 3 metre, for dogs up to 12 kg, blue. Description An all tape leash that extends and retracts, with a maximum length of 3m, allowing your dog to enjoy freedom of movement, while you remain in control. Features a reliable braking system, comprising of an easy to use brake button and brake lock, and an automatic retraction system. Suitable for small dogs up to 12 kg.